Downtown Memphis is the beating heart of the city that invented the blues and rock’n’roll, and the now-booming district is also home to the best nightlife in the city. Bars here range from cozy dives to speakeasies, and they often offer food to pair with the beer on tap. 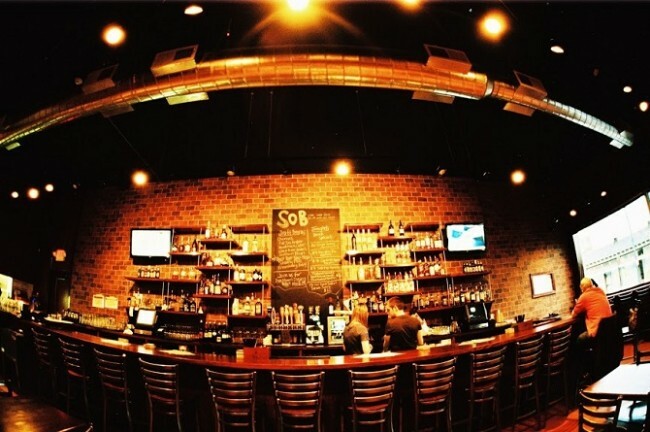 Finish off your day in Memphis with a tour of these ten best downtown bars. The Blind Bear Speakeasy promises a return to the 1920s world of speakeasies, even having access passwords on the weekends. The aesthetic extends to its cocktail menu, which features drinks like “The Flapper” and the “Bootlegger’s Mule” made with moonshine. For the food, the “Jager BBQ Burger”, and mac and cheese made with Pepper Jack cheese are highlights. The atmosphere is quite casual, with live performances Thursdays through Saturdays – and the weekend offers the “Hungover Like a Bear Brunch.” Check their Facebook page to find out the weekend passwords. The Mollie Fontaine Lounge has a rather unique location on the outskirts of the downtown district. It’s a converted Victorian house, packed with antiques, and it’s rumoured to be haunted. There are full bars both upstairs and downstairs, as well as plenty of comfortable couches and chairs. A piano player typically sets up shop in the downstairs foyer, and DJs come in to perform as well. Feel free to challenge the bartenders to come up with new drinks featuring your favorite spirit. If you’re not feeling creative, order from specialty cocktail menu. Make sure to order the outstanding truffle fries to pair with drinks. Earnestine & Hazel’s, like many other Memphis bars, is housed in a building that has a lot of history behind it. The building was formerly a pharmacy, then a cafe and lastly a brothel, but it’s now Memphis’ favorite dive bar and juke joint. Though the beer list isn’t as long as in some bars, all the domestic and foreign standards are available. For food, don’t miss the legendary “Soul Burger.” The secret “Soul Sauce” is what takes this burger from simple to extraordinary. Another main feature of this place is its excellent jukebox. Live music is played on the second floor. You may need to be just wary, though: this place is also known as America’s most haunted bar. 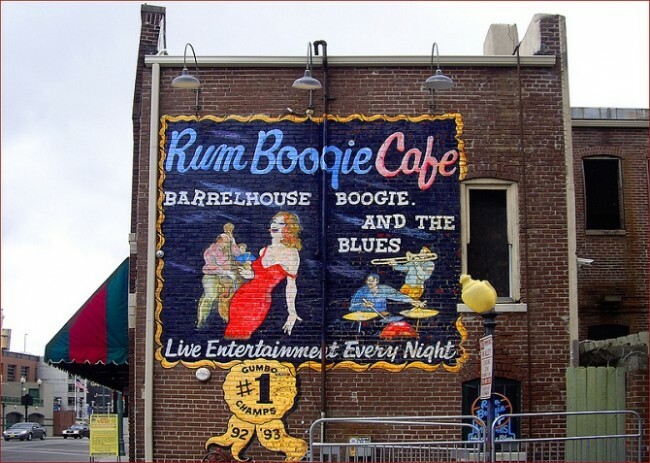 Rum Boogie Café is dedicated to music, just like its name suggests. Guitars hang from the ceiling and dollar bills signed by famous artists adorn the walls. On most nights, the house band performs, but other local bands and musicians stop by as well. The food on the menu is standard Southern fare, including an award-winning “Gator Gumbo” which has sausage, chicken, crab meat, alligator, catfish, and shrimp. Their oversized beers are designed specifically to take up and down Beale Street with you; for staying in, try their rum-based drinks. The Brass Door is an authentic Irish pub right in the heart of Memphis, housed in a former bank building. Though it is a pub, the food and decor are more upscale than you might expect, making this a good place for either lunch or dinner. For those not inclined to have a Guinness or Harp, the pub does offer house Pinot Grigio, Chardonnay, and a house red on its wine list. The menu includes traditional Irish fare, including shepherd’s pie served with soda bread, but for a more American-style dish try the “B.E.L.T.” sandwich: bacon, fried egg, lettuce, and tomato served with garlic mayo on toasted sourdough. The Silly Goose Lounge can be both a huge party venue great for dancing, as well as a laid-back bar and lounge, depending on the time of day. There is a heated patio outside, and the decor can best be described as urban with an upscale twist, with quite a bit of comfortable wooden furniture. For drinks, house favorites include “Peter Rabbit’s Revenge,” made with gin, cucumber, lime juice, and mint. Their mint juleps are also made with homemade mint syrup. Munch on the white cheddar popcorn or flat-bread pizzas if you’re not dancing along to the DJs’ music. Stop by on Monday nights for poker. The original B.B. 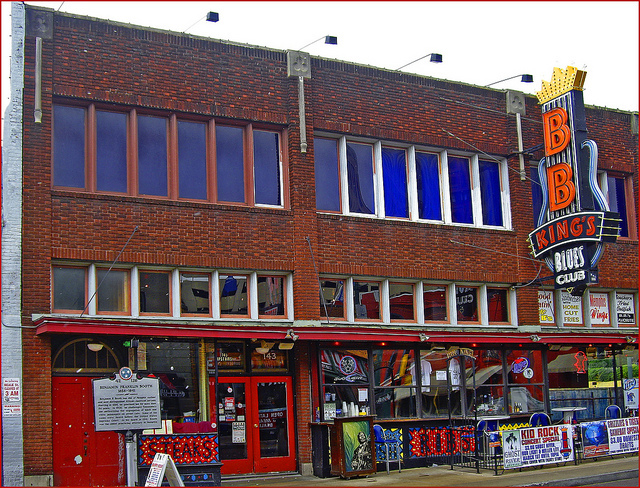 King’s Blues Club is right on Beale Street and is as much a restaurant and music venue as it is a bar. The ribs are, of course, one of the best choices here, on a menu that primarily features classic Southern fare. The B.B. King’s Blues Club All-Star Band emphasizes Memphis music in its sets, though it also incorporates pop and classic rock. For drinks, try the “Dixieland Delight,” with sweet tea moonshine, orange juice, sour mix and sweet tea. If going with a party, give the “Soul Bowl” a try, which is a mix of vodka, gin, tequila, rum, amaretto and more. The Kooky Canuck is an unexpected find in downtown Memphis, serving Quebec-style poutine, BBQ egg rolls, and the legendary “Kookamonga”: a monster 4-pound burger topped with lettuce, tomato, onion, pickles, and cheese. Finish it in an hour for a spot on the wall of fame. For a lighter dish, try the “Provincial Pear Salad” served with raspberry vinaigrette. The bar menu has an extensive list of Canadian whiskeys and beers. Cocktails include the “Canadian Sunset” and the “Maid of the Mist.” Both lunch and dinner are served. South of Beale bills itself as “Memphis’ First Gastropub,” and the menu backs up that claim. Gluten-free and seasonal dishes abound here. Otherwise, try the duck patty melt or shrimp and pimento cheese grits. The house specialty cocktails include a “French Kiss,” made with champagne and St. Germain. From the house martini list, try the salted caramel variant. There’s also an extensive list of bourbon-based cocktails. The star dessert is, without a doubt, the Jack & Coke bread pudding, served with whiskey ice cream. The pub’s atmosphere is warm and welcoming, and it can get busy despite being south of Beale Street. Flynn’s Restaurant is one of the only karaoke spots on Beale Street. While visiting one of the quintessential spots in American music history, why not have a go at some of the classics yourself? For those not inclined to belt out the blues, live performers are often there, typically locals who’ve been playing there for years. The bar specializes in deep-fried ribs, which are to die for; otherwise, go for the stuffed burgers. Drinks of the day rotate; for a more stable choice, the big beers or Barbados Sunrise should suit most needs.